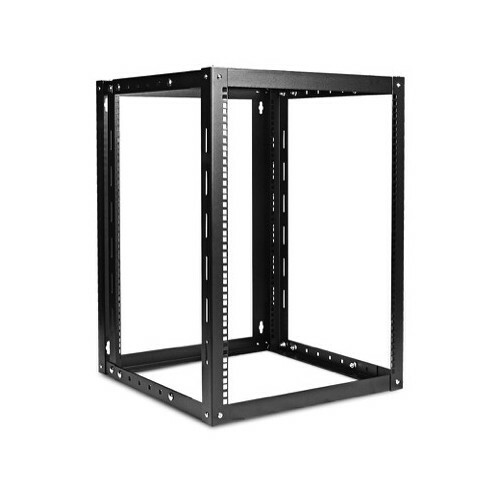 The black 15 RU Claytek WOM-1580 Adjustable, Wall-Mount Server Cabinet from iStarUSA Group is a high-quality steel rack designed to fit any standard 19" equipment, with a supported depth of 31.5" and under. The WOM series open-frame wall-mount rack can be used as a cost-effective solution for rackmount devices in SOHO (Small Office, Home Office), small business, research institutions, or other 19" rack applications. Also, open-frame rackmounts have higher thermal manageability by room or central air conditioning.